Handling mound, home plate and other area tarps can become quite cumbersome. They are usually wet and dirty, which sometimes also means they’re extra heavy, depending on the weight of tarp you are using and how wet and dirty they are. Back in my days with the Orioles we would just float the small tarps over to where the main infield tarp was stored on a tube. We would then fan fold the tarps onto the top of the infield tarp that was stored on the tube before covering the tube with a tarp tube cover. This actually makes for quick deployment in a rain delay as the crew can pull the cover off the tube and grab the mound and home plate tarps and just run with them, floating them right into place. Now, not everyone has a tarp tube on the side of their field to store the mound and plate tarps on because most ballfields don’t have an infield tarp on-hand. This is what inspired the idea for the Beacon Tarp Cart. Folding these tarps and carrying them off the field was always a sloppy and strenuous job, especially if they were the heavy, weighted tarps. 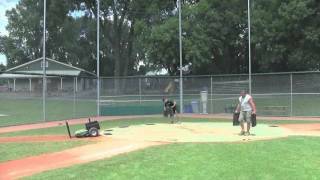 The Tarp Cart allows you to wheel the cart out right to the mound or plate area and place the folded tarps right on the cart which can then be pushed off the field like a wheelbarrow or towed off by a small tractor or utility vehicle. And, if you use Beacon’s Field Weights to weigh the edge of your tarps down in place of sand bags, the tarp cart conveniently stores and hauls the weights as well. 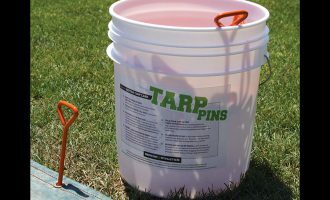 If you prefer to use tarp stakes to anchor your tarps, you can get the cart with the “pin holder option” to store and transport your tarp pins. 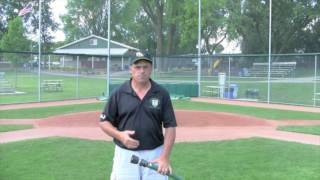 And speaking of tarp pins, have you ever lost a tarp pin in the grass only to “find it” with your mower or have a coach come up to you saying they found it lying on the field during a game or practice? Beacon’s Pro Tarp Pins are the perfect answer to prevent losing your tarp pins in the grass. The brightly orange powder coat painted tarp pins are extremely visible in the grass, making it super easy to find them in your turf — before the mower does. At Beacon’s test facility in Madison, Wisconsin, we have had the Pro Tarp Pins in use for three years on our heavily used native soil ballfields and have yet to lose the orange paint off of any of the tarp pins. Now, that’s durability! Before we had the tarp carts at the Madison testing facility, it was very common for coaches to ball-up or fold the tarps and just leave them sitting on the grass in the foul areas or behind the dugouts. Now, we all know what happens to grass that has had a tarp sitting on it with the sun beating down for several hours – it’ll burn the turf. As soon as we added the tarp carts at the research facility and he coaches routinely saw the tarps folded up on them, they followed suit and made sure the tarps were always properly stored on the carts. That meant the tarps were always elevated above the ground, thereby eliminating the risk of burning the turfgrass. The Beacon Tarp Cart will keep your area tarps and anchoring equipment in neatly organized and easy to transport, while taking a little of the dirty work out of the job. Storage, transportation, and deployment of your area tarps and field weights.